Dawn and Chris…..a little Quick Step and Rumba! Thank you to the creative team at WBAY for putting together this awesome promotion piece and special thanks to Todd Dively, the magic behind it all! WBAY Prize Patrol is BACK………..
1. Go to WBAY.COM, click on either Matt Smith or Rebecca Schuld’s picture to vote and donate to the Red Cross for your chance to win 2 (two) tickets to “Dancing With the Stars” February 18th at the Radisson in Green Bay as well as a wine basket from Wine Premiere valued at $150. 2. Entrants must be at least 21 years old and must be from WBAY-TV’s viewing area. Employees of WBAY-TV, Young Broadcasting Inc., participating sponsors, competing television stations, cable and satellite companies, and their immediate families are not eligible. 3. The contest entry period is Monday, Saturday January 28, 2012 – Friday, February 10, 2012. You can donate/vote as many times as you would like. For every $1 donated, you receive 1 vote and 1 entry. 4. Odds of winning are determined by the number of valid entries. 5. One winner will be chosen by random drawing Saturday, February 11 from all entries received. 6. The prize of two tickets to the “Dancing With the Stars” is valued at $160; the wine basket is valued at $150. 7. Winners will be notified by phone, email, orU.S.mail. In the unlikely event WBAY-TV is unable to contact a winner, another entry will be chosen to determine a winner. WBAY-TV is not responsible for errors, problems, or difficulties with printing,U.S.mail, internet (including e-mail), or telephone. 8. A donation to the Lakeland Chapter of the American Red Cross qualifies you for entries. 9. This contest may be discontinued or rules changed at any time without notice. 10. This contest is conducted by WBAY-TV whose decisions are final on all matters. 12. The prize is non-transferable, non-redeemable for cash and may not be substituted by the winner. Some restrictions apply. It also will be forfeited if not claimed within seven (7) days of notification and may be substituted by WBAY-TV in the unlikely event that it is unavailable due to circumstances beyond our control. Delivery is not included. 13. Winners agree that WBAY-TV, their sponsors, agencies and affiliates have no liability in connection with the acceptance or use of any prizes awarded in this contest. 14. A copy of these rules is available at the WBAY-TV studios located at 115 South Jefferson Street, Green Bay, Wisconsin, 54301. 15. 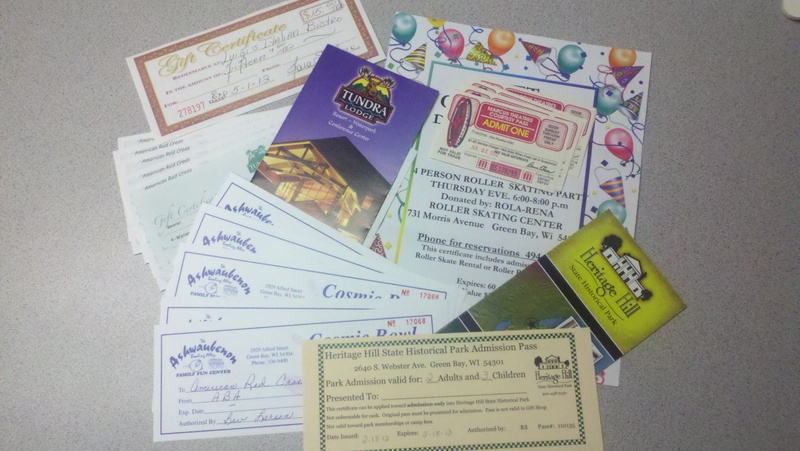 Upon completion of the contest, a complete list of winners will be available upon written request to WBAY-TV. A Vote for a Star gets you a Chance to Win this “Family Fun” Package! During the week of Monday January 30 – Sunday, February 5 if you give an on-line donation of $25.00 or more, your name will be entered to win the following prize package valued at $667.00!! Winner will be notified Monday February 6. You can vote for Bob (or any of our 2012 Stars) at www.redcrossdwts.org. Tickets Costs: Children under 1 are free. children 1-2 are $2.00 ($1.00 in advance), Children 2 and over and adults are $8.00 ($7 in advance). Find out more at encompasseec.org or by calling 469-1236. The Big Event is a magical, fun-filled educational fundraiser geared to children age 10 and under and their families. The Big Event is a community-wide project that includes costumed characters, stage entertainment, creative arts projects, hands-on science and health activities, nature, vehicles, kid-friendly food, stuffed animals, books, and much, much more. The Big Event is in its 24th year and is a major fundraiser for Encompass. Encompass is a not-for-profit organization providing care for children and support for families. Originally established in 1919, Encompass operates seven licensed child care facilities in Green Bay and De Pere. We thank Encompass for their support of Bob and our local American Red Cross!